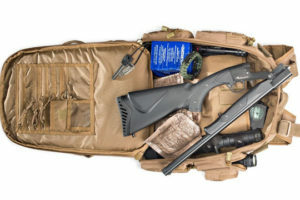 Thrift stores, yard sales, and army surplus stores can be rich hunting grounds for preppers. Often, you can find items that are normally unattainable, such as out of print books and well-maintained hand tools at surprisingly cheap prices. Just be careful of overpaying for items considered collectibles or antique. 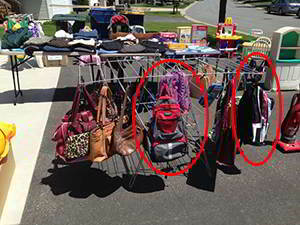 It is important to arm yourself with knowledge before purchasing items at yard sales and thrift stores. Not every item is a bargain: important parts may be missing, or prices may be too high for a used and abused item. Look for quality items that will give years of use. Fortunately, the internet makes research easy, even on the go. #1. 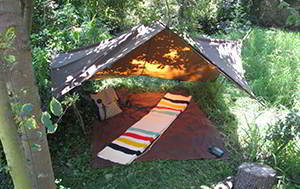 Sleeping bags and blankets—Good quality sleeping bags are often sold at very low prices by people who took one camping trip and decided camping was not their sport. Look for high quality sleeping bags rated for the coldest temperatures. Check them over thoroughly and disinfect and launder them immediately upon bringing them home. Also look for wool blankets and thermal blankets. #2. Cots and bed rolls—a stash of cots can make a big difference if you find yourself sleeping outside or if you have a sudden influx of relatives. Likewise, a nice cushion under the sleeping bag can make a big difference. #3. Tarps and canvas are extremely useful for many prepping applications. Often these are stacked away to be used as moving blankets or they may be found with blankets and linens. #4. Tents, extra stakes—check out tents thoroughly, looking for rips, tears, broken zippers, mold or missing pieces. #5. Camp stoves and outdoor cooking equipment can be a great buy. #6. Mess kits and canteens, but skip the foam insulated thermoses. The insulation breaks down over time and loses it effectiveness. Look for the old-fashioned vacuum thermos. #7. Good quality knives, look for both kitchen knives and multi-purpose knives such as K-Bar, Cold Steel, Gerber and Swiss Army. #8. Sharpening stones and steel to keep those knives in shape. #9. A Multi-function tool. Again, look for a quality tool that will last. #10. Canners, pressure cookers— Canners and pressure cookers are not necessarily the same thing. Water bath canners are relatively easy to find, look for the racks and accessories that go with it. Pressure Canners rarer, but available if you look hard enough or just get lucky. Expect to replace the seals and possibly the pressure gauge, so don’t overpay. Pressure cookers are smaller than canners and are for cooking, not canning. #11. Cast iron cookware is heavy, but it holds up well for cooking on a grill or over a campfire. You can often find rusted cast iron Dutch ovens, pots and frying pans at thrift stores. Don’t let the rust scare you, it burns off easily. You will need to spend some time re-seasoning them. Here are 60 cast iron skillet recipes. #13. 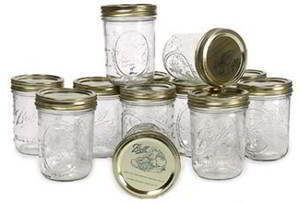 Tin cans, popcorn cans, and containers—popcorn tins and other metal containers can be a good buy, especially after Christmas. Large popcorn tins are rodent proof and good for storing food supplies. #14. Hand tools and carpentry tools will be invaluable should the power go down. Make sure they have been well maintained and operate as expected. Look for hand drills and bits, wood planer, post hold diggers, axe, machete, mechanic tools, hammer, screwdrivers, etc. #15. 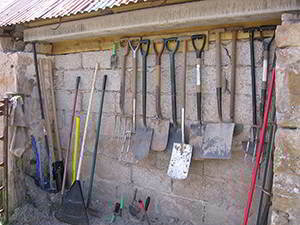 Gardening tools in good condition. You will need hoes, rakes, shovels and a wheelbarrow at a minimum. Also look for hand plows, scythe, and other handy gardening tools. Gardening tools will likely see hard use during a SHTF situation, so look for good quality and buy several whenever possible. #16. Books on gardening, survival topics, cooking from scratch and preserving food. Books are usually cheap at thrift stores, so pick up some for entertainment purposes, also. #17. Children’s books for entertainment and learning. #18. Homeschooling supplies like discarded textbooks, even teacher’s manuals and resource kits find their way to thrift stores. These are usually found at the end of the school year when teachers and homeschool mother’s clean out their bookshelves. Look for the literature classics, workbooks, flash cards and teaching games, and text books at levels at and above your children’s current educational status. #19. Picnic supplies and lightweight utensils, for camping and bugging out. Look for compact, stackable, and lightweight plates, cups, glasses and utensils. #20. Dehydrators​ often find their way to thrift store shelves, just be sure they are operating correctly. #22. Extra clothing for bugging out and car kits, including heavy coats, rain coats, and hard wearing clothes. If you have children, stock up on clothing in growing sizes. #23. Heavy duty boots in increasing sizes if you have children. Look for new and barely work pairs. #24. A vacuum sealer is handy for putting food away, but an expensive item. You can usually find one at a thrift store at a reasonable price, but check the seals to make sure it will function without leaking. #25. Shelves and storage units, just check that they are sturdy. #27. Flashlights, including the hand crank models. #28. Solar lights, for the yard or patio. These often just need new storage batteries. #29. Wheelchair, walkers, crutches and other medical equipment. If you have the space to stash these away, they could be important in an emergency. #30. Ammo boxes are for more than just ammo. They are rodent proof and make good boxes for burying a stash. #31. 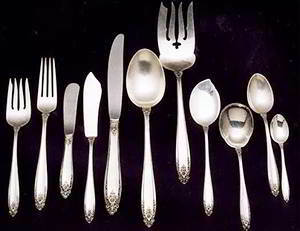 Sterling silver flatware—Silver is a natural antibiotic and preferable for use in questionable sanitation situations. It can also be a good investment when the price is right. #32. Silver and gold jewelry and coins sometimes find their way into estate sales and yard sales. Know your market here to avoid overpaying and don’t be fooled by plated items. #33. Grain mill, meat grinder, coffee grinder and other specialty kitchen tools. #34. Radios and emergency supplies of all kinds, especially hand cranked radios, weather radios, CB and ham radios. #35. Fishing equipment such as rods and reels, lures, line, tackle boxes, bait buckets, nets in good condition, etc. #36. First aid kits—check expiration dates on ointments and supplies. Also look for unopened boxes of gloves, ace bandages and other disposables. #37. Hunting supplies are often available at yard sales. 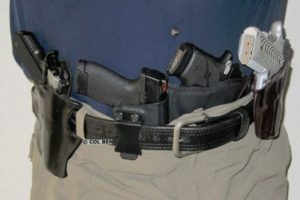 Occasionally you will find firearms and ammo, but other supplies are much more readily available. Also look for binoculars, bows and arrows, slingshots, compasses and night vision gear. #38. Camouflage gear in a variety too broad to imagine. #39. Board games, unopened puzzles, and well-built toys– check for missing pieces. These can be valuable morale boosters in a grid-down situation. #40. Hiking packs, frames and backpacks. Some manufacturers offer a lifetime guarantee. Look for quality packs capable of carrying heavy loads. #41. Camelback packs are great for hydration when hiking or in any outdoor setting. Clean and sanitize before use. #42. 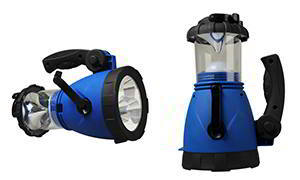 Gallon water bottles and larger water barrels such as rain barrels and water tanks. #43. Gas cans in a wide variety of sizes. #44. Sewing supplies — You should be able to pick up fabric, needles and thread, buttons, zippers, patches, pin cushions, measuring tapes, etc, for pennies on the dollar. Buy supplies for mending and even creating new articles. If you are lucky, you may even find an old treadle sewing machine. #45. Baby supplies such as cloth diapers, blankets, clothing, bottles, and bottle sterilizing equipment (which will be necessary again when SHTF). Think ahead and stock these items, even if there are no babies in your group currently. #46. Knitting needles, crochet hooks, and yarn. #47. Sewing, knitting and crochet patterns and instructions. #48. A good atlas and maps of your local area and state. 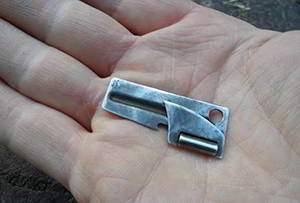 These are getting harder to find with the advent of GPS, but could prove vital to your family. #49. Propane tanks are often an excellent buy at yard sales and estate sales, but again, you need to know your local prices on these. #50. Heavy duty grill or smoker for use with wood or charcoal. Also pick up extra grill grates for use over a campfire.